Here it is, very happy with the results! We edited the lyrics abit just so it would fit more with my arm and balance out,for example the second line became a nobody instead of no one and there is anand take out of the last line, love it! 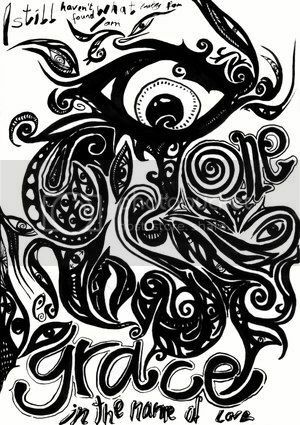 It is on my inner right forearm middle/back. That's pretty. I love it. Crazy, Crazy Crazy..... But If I met you and saw your arm. I would think how cool and I need to get to know this person better. haha oh dont apologise, Ive had tattoos since i was 15, Im now 19 as of a week ago on Sunday haha, 4 years! and my first was the simple words "U2" with a dragon above! That's probably one of the more original U2 tats I have ever seen. I really love it, Red Devil. Really tasteful, verycool. Aww thanks! that means alot! I like how you chose lyrics over a picture. Very original. Ouchies! How long did this take please? Its very detailed. Hers took around 3 hours.............I haven't had mine done yet........the design needs a bit more work......it needs simplifying down a bit. Liz that is really cool who designed that?! It's really impressive! My tattoo took about half an hour haha. The pheonix is lovely! nice tattoo. can relate to U2 helping through crap times too, also helped me through my fathers death. HTDAAB - as for Bono, that was the same forme. so why the hell not I agree, life's far too short! 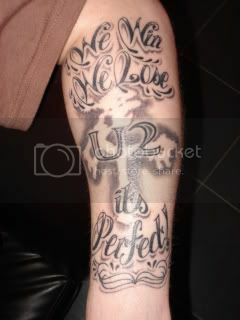 haven't got a U2 tattoo but would be seriously tempted! We edited the lyrics abit just so it would fit more with my arm and balance out,for example the second line became a nobody instead of no one and there is an and take out of the last line, love it! of a wuss, betthat hurt? Hey that's a bit special Bex! Nice choice. Make sure to get the Red Devils on the other arm for the perfect balance!! in the last zoo i posted 'do we have ant u2 tattoos'. there are quite a few on here who have tattoos. the suitcase with the heart seems quite popular.i think yours looks really great cos its u2 but it does'nt scream u2,great lyrics too. 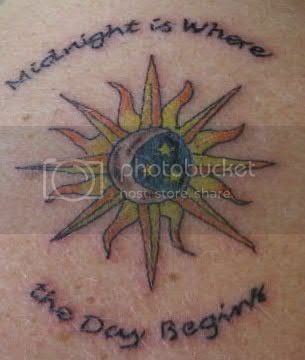 if you google u2 tattoo there are some pictures that are a bit tomuch. been planning one myself for a few months. i'll post it when i have it done. I have a simple "u2" aswell haha. On my leg, and its obviously going to nip abit but its hardly anything! That's sweet, really nice script. I have this myself, not fished yet as it's to be a half sleve when I get around to it. 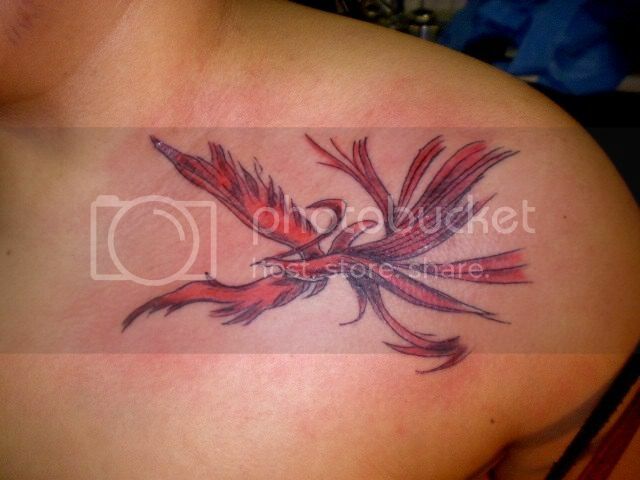 Tis smack bang top centre of my back (and I have 5 others unreleated to U2). Its a few years old now and needs reinking. I'm probably going to get itextended before the summer starts with stars, astral stuff and music notes from shoulder to shoulder to cover up a couple of things on each shoulder thati'm bored with now!